Chelsea began their Carabao Cup journey on Wednesday night at Anfield, facing Liverpool on the third round of the tournament. 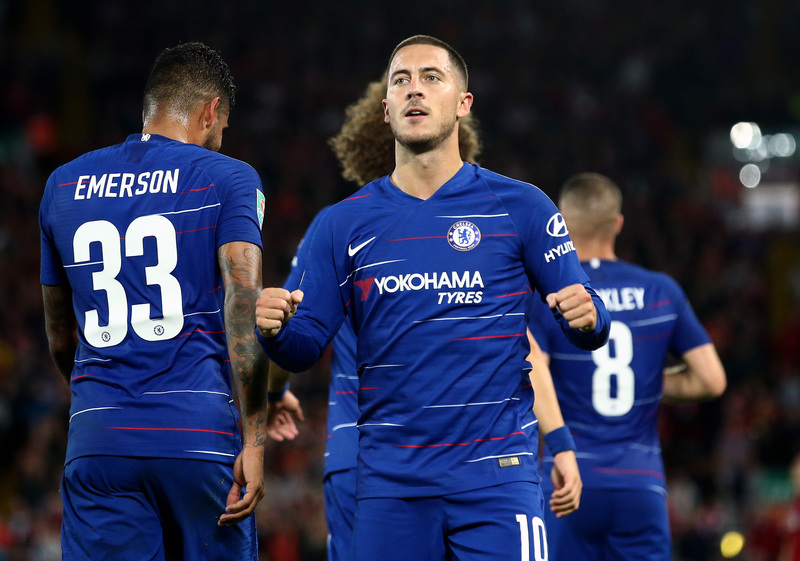 A very chaotic but sometimes flawless Chelsea performance led the Blues to the fourth round of the competition, as late goals from Eden Hazard and Emerson saw off Daniel Sturridge’s opener. Those who had used their Betfair bonus code 2019 to gamble on a Blue win were rewarded – but they were made to sweat for it. The tie was seen as a bit of a curtain-raiser ahead of the big Premier League clash next weekend, when Jurgen Klopp and Maurizio Sarri will be gathering up their strongest squads at Stamford Bridge. Tonight’s team selections only confirmed how the managers have their main focus on Saturday, as both sides made as many as eight changes to their starting line-ups. Fringe players such as Victor Moses and Emerson were both given the nod, but youngsters Ruben Loftus-Cheek and Ethan Ampadu were oddly left out of the team bus. Callum Hudson-Odoi only made the bench as well. Chelsea started the game very brightly, making their way into the Liverpool box several times inside the first ten minutes. Andreas Christensen had a good header from a corner saved by Simon Mignolet, who also denied Alvaro Morata twice in quick succession. The Blues controlled the game for the majority of the first half, while Liverpool preferred to trouble Chelsea with their quick counters. Xherdan Shaqiri, Sadio Mane and ex-Chelsea man Daniel Sturridge were the focal points of the hosts’ attacking force tonight, with Roberto Firmino and Mohammed Salah watching on from the bench. Tonight’s captain Gary Cahill impressively kept the pacey forwards quiet, while Cesar Azpilicueta had some difficulties on his side of the field. Liverpool found some momentum after 35 minutes of play after an appeal for handball inside the Chelsea box. The referee – assisted with VAR tonight – made the right call not to point to the spot though. Chelsea failed to calm the game down and Willy Caballero was soon called into action. A long-shot from Naby Keita was first saved with a brilliant dive from the Argentine keeper, and he followed it up by another vital stop from Mane’s close-range header. Chelsea couldn’t have gone much closer to conceding at the end of the first half, but survived from their defensive turmoil and the scores were even at the break. The second half began with another big scare though, as Christensen’s awful back-pass came straight for Sturridge on a run. The Englishman already got past Caballero with his run, but missed the empty net with his right foot to enter the competition for Miss of the Season! It was like a Christmas gift in advance, and Ross Barkley was close to handing Mane one of the same kind just minutes after, but it was Caballero for the rescue – again. Chelsea were closer to scoring for Liverpool than for themselves in the first half, and it was no surprise that the hosts opened the scoring. After 59 minutes of play, Sturridge made up for his earlier mistake by volleying the rebound from Mane’s strike into the back of the net. Sarri reacted by bringing on Eden Hazard and N’Golo Kante, but Chelsea didn’t seem to find an end to Liverpool’s dominance on the ball. The Blues were rarely able to build an attack all the way to the final third of the field and lacked an effort on goal every time they did. However, Chelsea took the advantage of a wide free-kick! Ten minutes before the end of the game, Hazard’s lovely cross was headed on goal by Barkley, only to be denied by Mignolet. Emerson – of all people – nodded in the rebound and the visitors were level! Liverpool refused to give in to the equalizer and kept on pushing forward. Sturridge struck one from distance, and it was inches away from going in, going out for a goal-kick via the woodwork. Then, out of nowhere, Eden Hazard happened. The Belgian received the ball in the middle of the Liverpool half, took a turn and started racing to the right flank – nut-megging Firmino in the process. He then played a one-two with Kante before continuing his run towards the penalty area, where he nut-megged Moreno before firing an unstoppable strike into the net, giving Chelsea the lead! The game seemed long lost already, but when you need a hero, Hazard is there for the rescue! Chelsea did their everything to retain the lead – and made no mistake doing so! The Blues were able to hand Liverpool their first defeat of the season while bouncing back to winning ways from last Sunday’s West Ham draw. After three goals, eight bookings and plenty of mistakes and successes, this Saturday’s game between these two teams should be quite the match to look forward to! COME ON CHELSEA!